The Norman N XS fills the niche between the Deep Little N and the DD22. The elevated lip of the N XS makes for a faster vertical dive. The N XS dives 12-16 feet, picking up where the Deep Little N tops out and just under the DD22 maximum depth range. The body of the N XS is between the size of the DLN and DD22. The 2.5" body length and 1.0" width make it a tasty offering for most situations. Weighing 5/8oz, the N XS casts like a bullet, but still has the buoyancy to back up from brush when contacted. 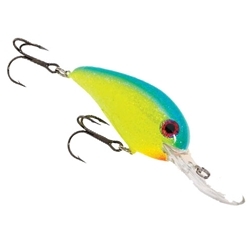 A head to tail medium swimming motion makes for realistic baitfish action.